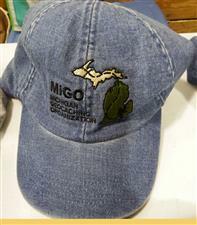 The MIGO baseball cap is embroidered with the state of Michigan divided into the 4 MIGO chapters and Hiker Dude. This heather gray polo shirt is embroidered with the MIGO seal. It is short sleeved by Gildan DryBlend 50% Cotton 50% Polyester blend. . This heather gray polo shirt is embroidered with the MIGO seal. It is short sleeved by Gildan DryBlend 50% Cotton 50% Polyester blend. The MIGO youth baseball cap is light blue demin. 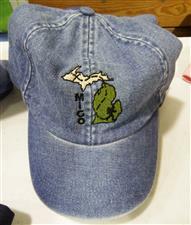 It is embroidered with the state of MIchigan and Hiker Dude.